Full Support with iOS versions and all future updates(Apple CarPlay is not supported). Ultra slim design,feel like feather,Only add 0.18inch and 2.22 oz to your iPhone 6/6S. Use original lightning cable to charge your iPhone 6/6S and battery case at the same time, as well as sync your iPhone to iTunes without removing the battery case. Not compatible with iPhone 6 Plus or 6s Plus. Please use smiphee iphone 6&6s battery case in proper temperature range(under 40℃) and do not put it under heat, source or into any liquid. Do not carry or use the product when you are participating an activity in extreme environment, like snowboarding, ski, swimming, diving. Please use original apple lightning cable and wall adapter(5V/1A ONLY) to charge smiphee iphone 6&6s battery case,Smiphee iphone 6&6s battery case does not support high voltage or QuickCharge deployed adapters. 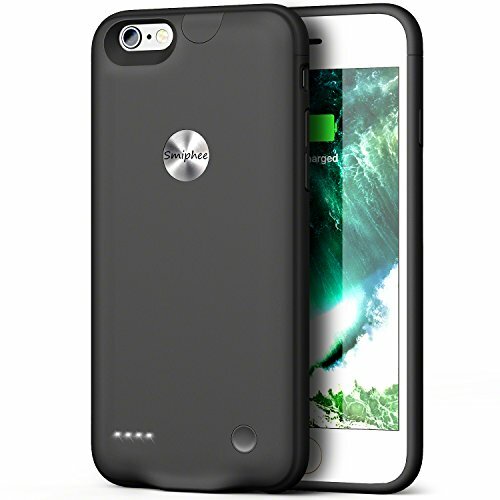 【THIN AND LIGHTWEIGHT】: (IMPORTANT NOTE: Smiphee iPhone 6 &6s battery case does not support Car Charger, High Voltage or QuickCharge deployed adapters)Smiphee iPhone 6/6s battery case is one of the slimmest charging case, adding only 0.18 inch and 2.22 oz to your iPhone 6/6s, thinner and thinner,feel like feather. 【EASY TO USE】: No excessive bulk, just feel free to use your headphone (lightning headphone is not included) without audio jack extender.Ligthing cable input,then you can charge your battery case and iPhone 6/6s simultaneously with your existing iPhone lightning cable. 【ADVANCED SYNC-THROUGH TECHNOLOGY】: You can sync your iPhone6/6s to your Macbook, PC or laptop without removing the battery case. 100% compatible with all iOS versions, Apple Pay, and future iOS software updates(Apple CarPlay is not supported). 【DOUBLE YOUR BATTERY LIFE】: The powerful 2500mAh built-in lithium polymer provides an extra 11 hours talktime, 8 hours internet use,7 hours gaming to your iPhone 6/6s. 【100% MONEY BACK GUARANTEE】: If you are not satisfied with our battery case,let us know and you will be offered a full refund or replacement. Enjoy this absolutely RISK FREE purchase by clicking the yellow Add to Cart button. If you have any questions about this product by Smiphee, contact us by completing and submitting the form below. If you are looking for a specif part number, please include it with your message.